﻿We start with sad news. 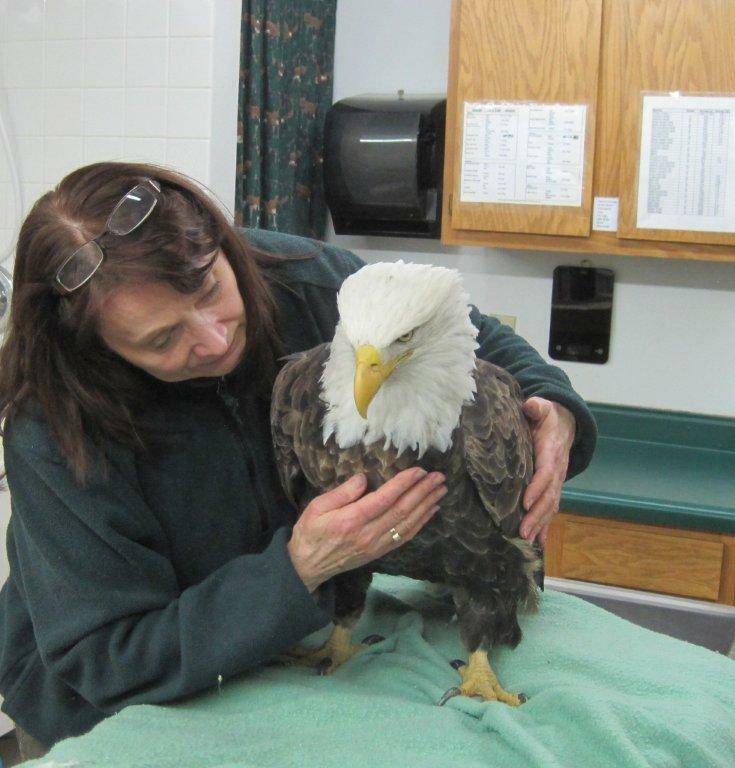 Our beautiful female Bald Eagle #005 succumbed this morning to multi-organ failure due to toxicity. We will have a necropsy to make certain lead was the only toxin involved in her case. #005 was an amazing gentle eagle. She had many years under her wings over the farm in Polar, WI. Her family and those of the landowners grew up knowing each other. She will be missed. Each time we lose an eagle to lead poisoning I promise we will work harder still to educate the public. I would appreciate if each reader of our blog would do so as well. We hate to lose them. We tried our best, but it is always difficult. He was likely hit by a car...and suffers from lead poisoning. 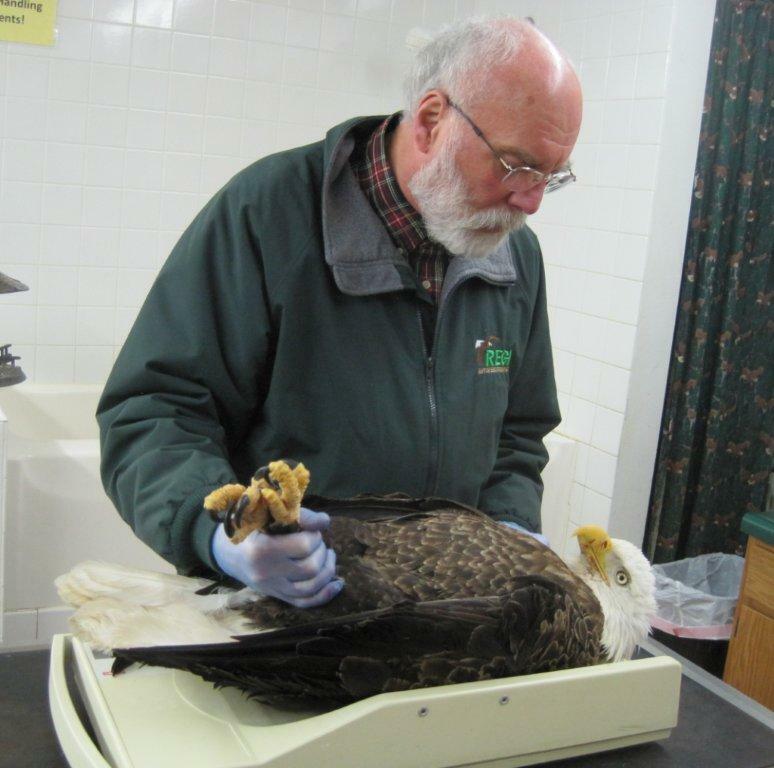 About 6:30 p.m. this evening we admitted another adult Bald Eagle, #008, from Marathon, WI. He was likely hit by a car. In wild patients, unless someone sees an accident occur, we have to piece the history together from clues. Sometimes we feel like detectives. #008 was first spotted near a busy country road. 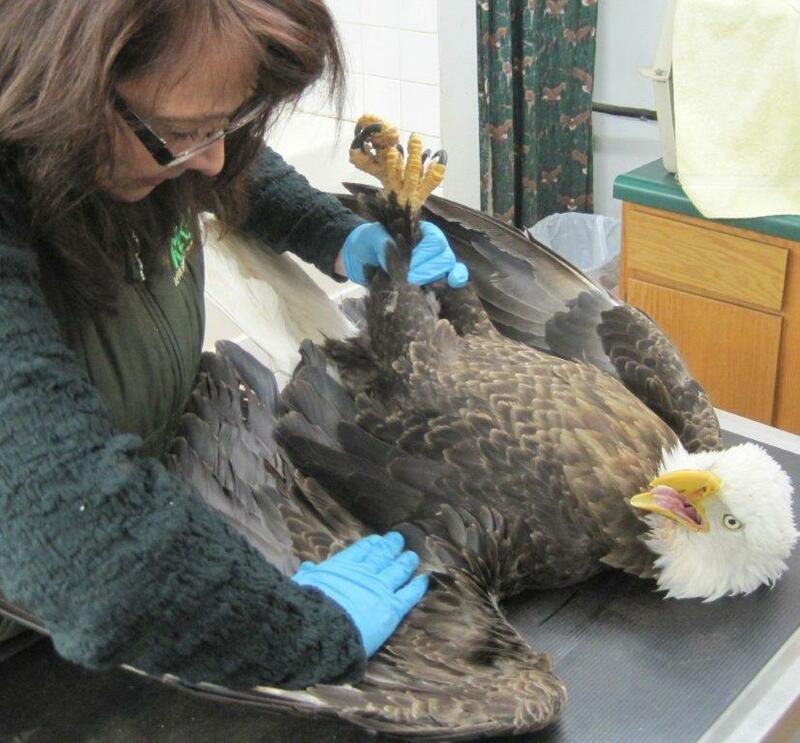 He has internal bleeding, a left wing fracture and ...you guessed it, lead poisoning. When a bird, or a human for that matter, has lead poisoning, they are disoriented. Judgment and depth perception is affected. Because of this, they suffer from accidents at an increased rate, such as being hit by cars. We are grateful his level of lead is high, but not over the limit as our last two eagles were. We will wait at least until he stabilizes before beginning the CaEDTA treatment. Internal bleeding all by itself is a very serious situation. The wing fracture is the radius but the ulna is intact. If he has to have a wing fracture, that is a good one to have. It is the least of his problems. REGI's Steve Fisher rescued #008 during a harrowing adventure through snow and challenging terrain. Thanks to the landowner that spotted the eagle and called the Marathon County Sheriffs Department who alerted us to the eagle in trouble. Long time volunteer Steve Fisher, took the call to rescue this eagle. Getting to the site before dark and then tracking the eagle through deep snow and challenging terrain was an experience right out of the movies. 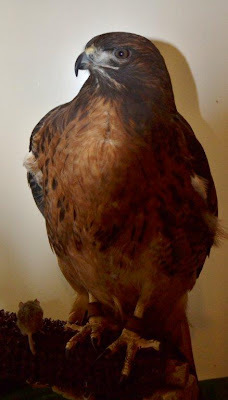 Juliet our 23 yr old education Red-tailed Hawk in a photo tonight. ﻿﻿ Our 23 yr old education Red-tailed Hawk Juliet became ill 2 nights ago. Our Juliet is a California girl. She came to us when she was just 18 months old from San Dimas, CA. She has educated hundreds of thousands of people over these many years and is a part of the REGI family in the most real sense. We hope she can continue to do so. It is amazing when children run up to us as events and are eager to tell that their parents saw Julie when they were in school. Please hold her in your thoughts this week. We have many school education programs this week as well. With the help of some great volunteers from Madison, we are working on a new web site. All of our other patients continue to improve! Yea! Tomorrow is the 31st! I might not get to a blog, as I have to finish those tedious end of year reports. Color me crabby. In addition, as if it were scripted, my computer crashed on Sunday. I am grateful for all of our terrific friends and supporters that have been so amazing! Thank you all. Marge, I feel for you and your loss and hope that JULIET makes a full recovery. I just lost a redtail at 21. I received him as a six month old and he was the best educational bird. I will miss him forever but know he's now flying in the clouds and enjoying his new life. I also have a golden eagle with lead poisoning. She's finished her first CaEDTA session and goes in tomorrow for another blood test. Her attitude is super, she's eating cut up meat and rats, her problem is her inability to open her feet. Just this evening I noticed a bit of movement in her toes so my hopes are going up that she'll be okay in the end. Do you usually use subcutaneous injections for the EDTA or only as an alternative? Sometimes I feel I've about punched her full of holes.